Virginia Lawyers Weekly has been the commonwealth’s top source of legal information for practicing attorneys since 1986, providing a traditional weekly newspaper with innovative Internet benefits, e-mail services and Web-based reporting. The newspaper reports all decisions issued by the Supreme Court of Virginia, the Virginia Court of Appeals and the 4th U.S. Circuit Court of Appeals. Also featured are hundreds of rulings from state Circuit Court judges, U.S. District Court judges, U.S. Bankruptcy Court judges, the Virginia Workers’ Compensation Commission and other state agencies. News coverage highlights developments in case law, changes to court rules, verdict & settlement reports, bar-discipline notices and all other news vital to Virginia lawyers. Virginia Lawyers Weekly’s website, valawyersweekly.com, presents breaking news stories and digests of important new opinions. Subscribers to Virginia Lawyers Weekly have unlimited access to the Web site, including an Archives that contains all the newspaper’s stories and case digests since 1993. Subscribers also have access free full-text PDF copies of the opinions featured in the newspaper. 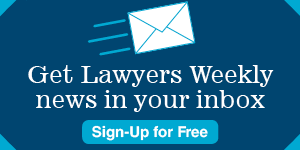 Virginia Lawyers Weekly welcomes comments to the articles and posts on this site. Comments should be succinct and relate to the story to which they are posted. We moderate all comments, and they will be reviewed for tone, language, length and relevance. We reserve the right to reject or remove any comment in our sole discretion. The newspaper offers a Daily Alert e-mail containing links to legal stories across Virginia.